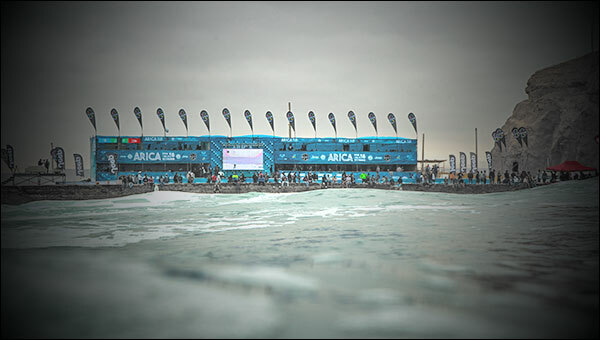 Arica, Chile (Tuesday, May 29, 2018) – Lucas Chianca, recent winner of the Nazaré Challenge as part of the WSL Big Wave Tour, feels that when conditions get heavy, his performance level also rises to the occasion. The Saquarema local is no slouch on a shortboard either, as was the case on Tuesday for the start of the WSL Men’s QS 3,000 Maui and Sons Arica Pro Tour in Chile. Chianca had been a standout in the freesurf sessions and went full tilt on the solid waves in the 6-foot plus range (2+ meters) along the fearsome reef at El Gringo, grabbing the two best tuberides of the competition. The first was on a large lefthander which earned him an 8.00 for extended barrel-time. Lucas followed with another deep one for a 7.33 and a ticket into Round 2. “El Gringo has already blessed us with incredible waves. Even though the tide is a little high, I still got really good barrels, so I’m happy to be here,” said Chianca. “I missed an epic swell in Fiji, but I’m surfing a wave that I love too. I’ve been coming to Arica for six years and El Gringo was my university. It’s where I learned how to ride big, heavy barrels and it’s what’s prepared me for surfing waves like this all around the world. It feels great to be back and I hope I can keep making heats,” concluded Chianca, whose 15.33 total was the highest of the event. Despite the solid swell on hand, most waves turned into closeouts in the morning and as the lunchtime onshore wind picked up, the waves began pinching, no longer providing barrel sections. After starting Round 2, event organizers opted to call the competition off for the day after Heat 3. The forecast however looks like plenty of swell will be on offer during the event window which goes from May 29 to June 3. Arica, in the region of northern Chile known as “the land of eternal Springtime” is one of the driest places on the planet, rarely raining. Luckily, mornings begin with little to no wind, keeping conditions glassy. But like clockwork, as noon approaches, so does the onshore wind, making a barreling wave like El Gringo deteriorate. However, the heavy cold-water barrels are a major attraction to gung-ho surfers from around the world. Evidence of that is represented by the 108 athletes from 19 different countries that are in Arica for the Maui and Sons Arica Pro Tour. Brazil leads the pack of competitors with 26 surfers, followed by 19 from Chile, 15 from the USA, 13 Australians, 8 athletes from Peru and others from Argentina, Portugal, Ecuador, Hawaii, France, Mexico, Costa Rica, Chile, Spain, Germany, Ireland, Japan, Uruguay, Columbia and Puerto Rico. Some notable surfers competing for the 3,000 WSL Qualifying Series ranking points are: Wiggolly Dantas (BRA), Jack Robinson (AUS), Aritz Aranburu (ESP), Raoni Monteiro (BRA), Carlos Munoz (CRI), Torrey Meister (HAW) as well as a long list of exceptional tube riders. A call is set for 6 am local time for continuation of the WSL Men’s QS 3,000 Maui and Sons Arica Pro Tour. Heat 4 of Round 2 will see Australia’s Luke Hynd face up against João Chianca (younger brother of Lucas) and the Chileans Cristobal Montecinos and Danilo Cerda.